Submitted by webmaster on 01/29/2017 - 10:55. 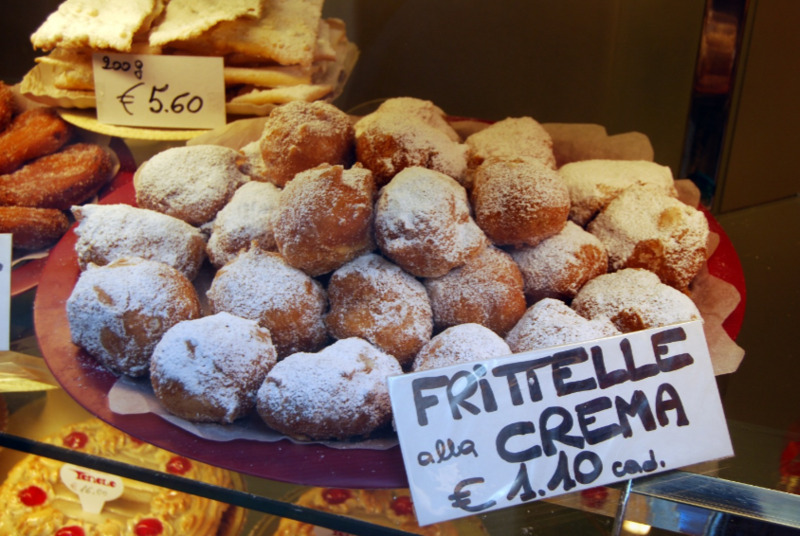 The frittelle were the ‘national sweet’ of the Repubblica Serenissima and they were made by the so-called fritoleri. In a very short time, these fritoleri became so many and so infulential into the life of the city that they were enable to give birth to a corporazione (a sort of corporate association) during the XVII century. In the corporazione there were almost 70 fritoleri. Every fritolero was in charge of producing and selling the typical Venice carnival sweets in a circumstanced area. However, he could also leave his laboratory to his sons or relatives so to preserve the art and the public selling through time. 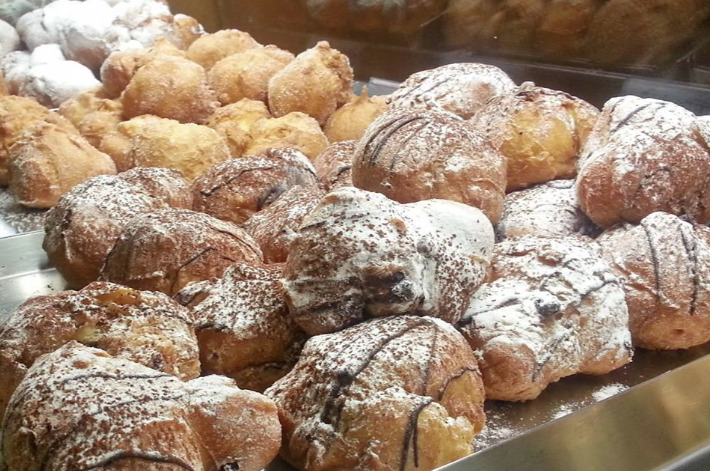 The fritoleri disappeared at the end of the XIX century when cafés and patisserie proposed new ways more social appealing ways of enjoying the pleasure of sweets (see our idea of accommodation, right in the middle of the venetian ‘patisserie district’!). The first frittella recipe belongs to the XIV century and it is preserved at the Biblioteca Nazionale Canatense of Rome. However, if you want to make your own frittella here find the recipe which is not the original one, but we guarantee that it is very good. The ingredients are: 25 gr of yeast, 300 gr of flour, ¼ of milk, 3 eggs, 100 gr of sugar, some lemon rind and a bit of salt. If you like you can add 70 gr of sultanas, 30 gr of pine nuts and a bit of grappa or rum. You need also some oil to fry (get your holiday flat near the Venice traditional marketplace!). To make the best of the Venice carnival sweets, the frittella, you have to melt the yeast in warm milk and melt the butter a bagno-maria. Take the eggs and put them with the sugar. You have to beat the eggs and the butter until you will have a white, soft cream. Then, add the yeast, the butter, the lemon rinds and a pinch of salt and bland it. At this point, if you like, add the sultanas, the pine nuts and the grappa/rum. After one hour, when the compost will be double its volume, get the oil very hot and fry the frittelle. When your Venice carnival sweets will be cold, add some sugar on top. 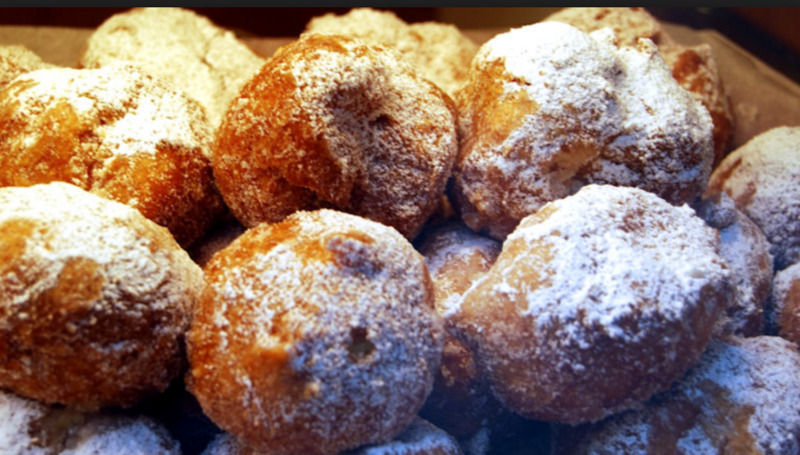 The frittelle, one of the most well-known Venice carnival traditional food, are delightful with a sweet wine. However, if outside it is cold, you will feel perfectly satisfied if you eat them with a cup of tasty, hot chocolate.